LinkedIn’s Live with Marketers Series Won a Finny! 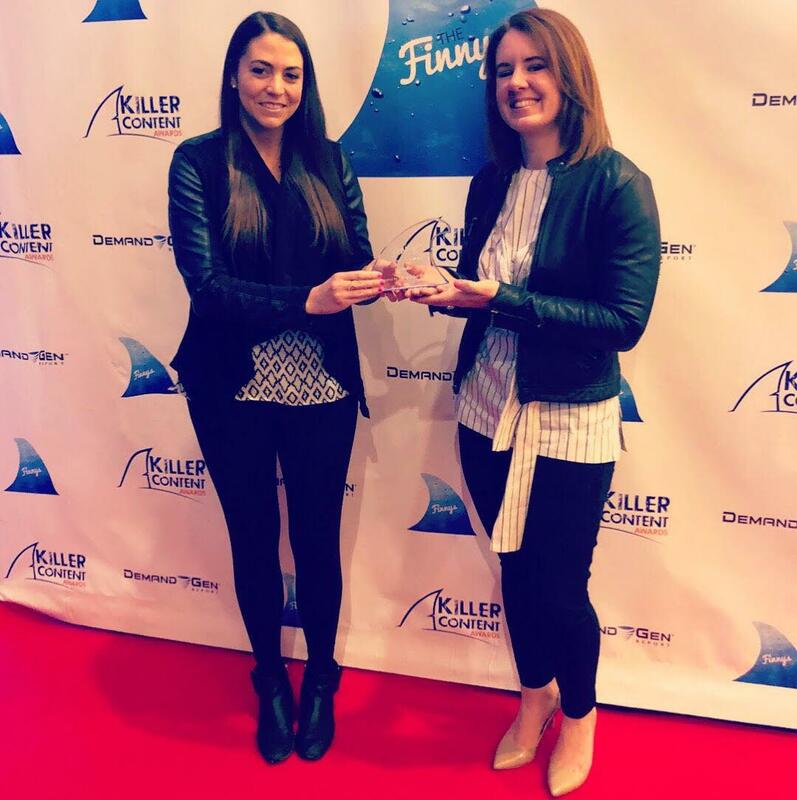 In February, at Demand Gen’s B2B Marketing Exchange 2018 in Phoenix, our team at LinkedIn Marketing Solutions was delighted to receive a Killer Content Award in the category of Best Video Content. The Finny, which recognizes “immersive storytelling delivered through interactive and even customized experiences,” went to our Live with Marketers series, LinkedIn’s first-ever morning talk show for marketers, by marketers. In line with our continuing focus on helping marketers excel with B2B video, we thought we’d retrospectively dissect the process of concepting, planning, and executing this initiative. Hopefully this step-by-step recap of our experiences can help you strategize your future video marketing campaigns on LinkedIn and elsewhere. First things first, the idea spawned from our desire to take webinars to the next level. We didn’t want someone speaking from a script, talking about slides. We wanted a fluid conversation, a “Webinar 2.0” so to speak. But we didn’t want to call it a webinar, so we went with “episodes” and featured minimal slides – just enough to visually illustrate the main points. We were keenly aware that the time for B2B video is now. Given a choice of content types, most people would rather watch video, and video offered us an excellent opportunity to humanize our brand. With video, we could showcase the personalities on our team. Our audience could see how we express ourselves and how we react, allowing them to feel more connected to us than if they were served the same information via a different format. Adding to the intimacy was the interactive nature of the episodes, which featured live poll questions and reactions to the incoming data. Concept in hand, we engaged our amazing LinkedIn Media Production team, who helped us bring our idea to life in such a polished way. We’re incredibly lucky to have them. We realize that marketers don’t always have access to extensive video resources. If you don’t, it’s still possible to produce remarkable B2B video on a budget. To execute our vision, we partnered with On24 to design a new, customized webinar platform experience. I hosted the first episode, which featured guests from LinkedIn’s internal teams. Then we expanded to include partners like AdStage, HubSpot, and Hootsuite. To keep things fresh and relevant, we rotate hosts based on topic and expertise. We discovered yet another advantage to making Live with Marketers interactive when we began to crowdsource topics based on questions received during Q&A and poll questions. We had no idea how many ideas would stem from this. Since many of our guests are influential and active on social media, it made sense to include their networks and databases in our promotional campaigns. We live-streamed the episodes on YouTube on sponsored it in the LinkedIn feed. After Season 1, we created highlight and blooper reels to get our audience excited for Season 2. We saw a dramatic increase in social interactions during the episodes, and even better, the interactions were super positive. These broadcasts have surpassed benchmarks for traditional webcast formats, including off the charts NPS scores and record-breaking attendee and registration numbers. We've also seen higher projected revenue from deals closed from this series versus a traditional webcast format. “I've attended countless marketing webinars and this was the first one I felt was valuable and not a waste of time. It was so refreshing and I look forward to attending more of them." If you’ve followed our blog, you know we don’t let good content go to waste, even “live episode” content. To maximize the return on our efforts, we slice and dice the topics for reuse. This includes social snippets on specific topics to drive eBook downloads, dissecting a discussed topic to drive traffic to the blog, and driving audience members to the series homepage, where they can catch up on all the Live with Marketers episodes they may have missed. Stay tuned for the next episode airing late April! Speakers and final date will be announced shortly. Speaking of video, you might have heard that LinkedIn just went all-in on B2B Video. For more information, go to linkedin.com/videoads. To learn more about best practices we’ve compiled from the more than 300 million video impressions and 7,500 ad campaigns, visit our video ad tips page.